1. What Made the Communards Attempt Heroic? The Franco-Prussian War broke out in 1870 and led to the downfall of Louis Napoleon (Emperor Napoleon III) and the Second Empire. The German army surrounded Paris and France was forced to surrender. The war ended on May 10, 1871. The working people of Paris became radicalized during this period, repudiated the legitimacy of the bourgeois government, and started a revolution to establish a socialist commune in Paris. The government fled to Versailles. The commune lasted from March 18 to May 28, 1871 when the French Army reimposed bourgeois rule in Paris by means of a blood bath. From his vantage point in London Marx was a keen observer of what was happening in France. In late 1870, with revolution in the air, Marx warned the workers of Paris NOT to start a revolution to overthrow the French government. Lenin says Marx thought it would be the "folly of despair." The over all balance of forces was extremely unfavorable. However, in March of 1871 the French government began to take measures against the workers that forced them to fight back and the die was cast. Even though he was pessimistic concerning the outcome, once the workers took up arms, Marx became one of the most ardent supporters of the Commune. The heroic failure of the workers, in Marx's words, "to storm heaven" was not in vain. Although defeated their experience provided invaluable lessons for the working classes throughout the world, as Lenin put it. In the same way the experience of the Soviet Union and its ultimate defeat has left a trove of lessons for the working class of the twenty first century and will make the future (far future I fear) world socialist state immeasurably stronger and more stable due to the lessons learned (if learned) and errors not repeated. Due to opportunistic and revisionist leadership in the working class, Lenin says, most people now think Marx and Engels meant the workers can't just violently overthrow the state all at once but must gradually reform it part by part until it has become a socialist state. After all, the communards got wiped out when they violently seized power in Paris! Lenin held that Marx (and Engels) meant just the opposite. The workers can't just "lay hold" of the state-- they must bust it up and make a new kind of state. Marx thought the communards were in the process of trying to do just that when they were overcome by the superior strength of the French state and the regular army. It was not the attempt to "smash the state" that led to their defeat-- but it was a premature attempt from an initial position of weakness and that the armed struggle was forced upon them before they were ready for it. Lenin cites Marx's letter to Kugelmann of April 12, 1871 to support his interpretation. In that letter Marx says that "to smash" (zerbrechen ) the state "is the precondition for every real people's revolution on the Continent." It is interesting to point out that Marx implies that a successful uprising, the government being overthrown and a new government installed does not constitute a real revolution-- no matter what it is called- coup, rebellion, revolt, uprising, etc., it is not a revolution. A revolution takes place AFTER the overthrow of the government and only after the state has been "smashed" (destroyed). This is the "precondition" of the revolution which consists in the construction of a new kind of state-- a worker's (or worker's and peasant's) state. Thus, for example neither the overthrow of the Shah in Iran, of Mubarak in Egypt, nor of Yanukovych in Ukraine, were revolutions in the Marxist sense-- but merely the replacement of one form of the dictatorship of the bourgeoisie by another form. They were intra class coups. A "people's revolution" on the contrary, Lenin says, is one in which the vast majority of the people, including the lowest social groups, "come out actively, independently, with their own political demands." Lenin notes that Marx limited his remarks to the European "Continent"-- not including the UK or the USA (never mind the rest of the world). Lenin says this was ok for 1871, when Marx wrote his letter, because at that time in the UK and the USA there was still possible a peaceful revolution not involving smashing and bashing the state. This is because they were fully developed capitalist states without fully developed military-bureaucratic cliques controlling them. This was changed by WWI and "the last representatives of Anglo-Saxon 'liberty'" are now run by such cliques and need a good smashing as well. Today we call this "clique" the military-industrial complex-- it is international in nature- and wherever it dominates a peaceful revolution would not be possible according to Lenin. But is it possible to weaken the power of the military-industrial complex by people's struggles to such an extent that it is no longer dominant? Is this just wishful thinking and we really are on the darkening plain? In trying to adapt Marx, Engels and Lenin's ideas to today we must remember, as Lenin pointed out, that in 1871 the proletariat was not the majority in any country of continental Europe and the "people" was represented by the workers and peasants together. 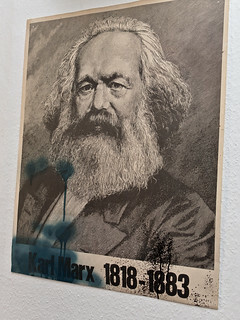 Marx thought the bourgeois state machine had to be "smashed" as that was the only way the workers and the poor peasants (i.e., the lower strata of the petty bourgeoisie) could have a free alliance and, Lenin says, "without such an alliance democracy is unstable and socialist transformation is impossible." Is such a characterization still valid with regard to workers and the lower and middle strata of the petty bourgeoisie in the 21st century? Just what was supposed to replace the "smashed" bourgeois state? We will consider the answer in the next article.